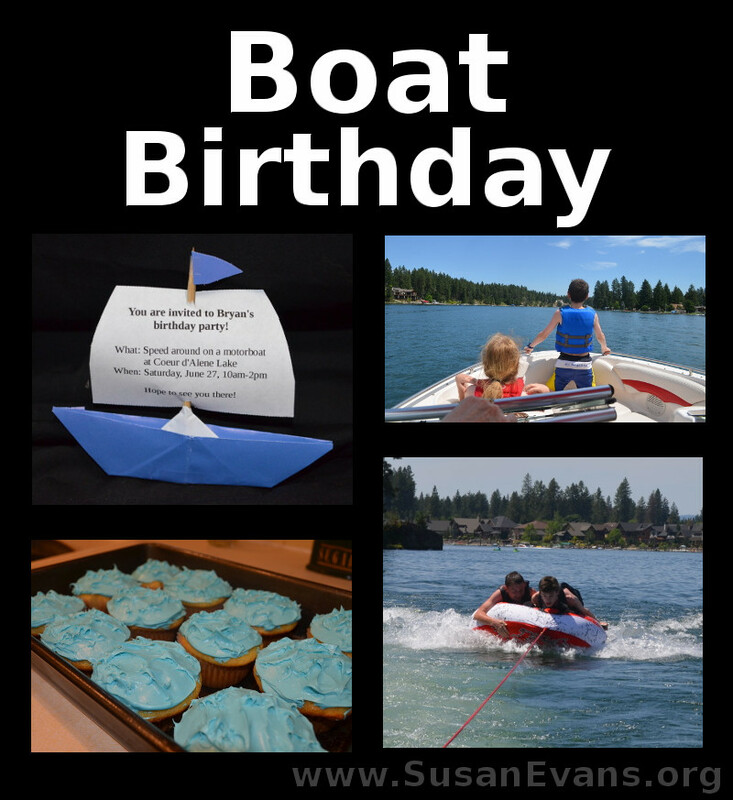 A boat birthday is perfect for the summer! What better excuse to spend some time on a nearby lake? Last weekend we celebrated my son’s birthday by giving him a boat birthday party. If you have friends who own a boat, it doesn’t have to cost you any money. If you don’t have friends who own a boat, you will need to save up to rent a motor boat. But it’s an experience that your family will never forget! 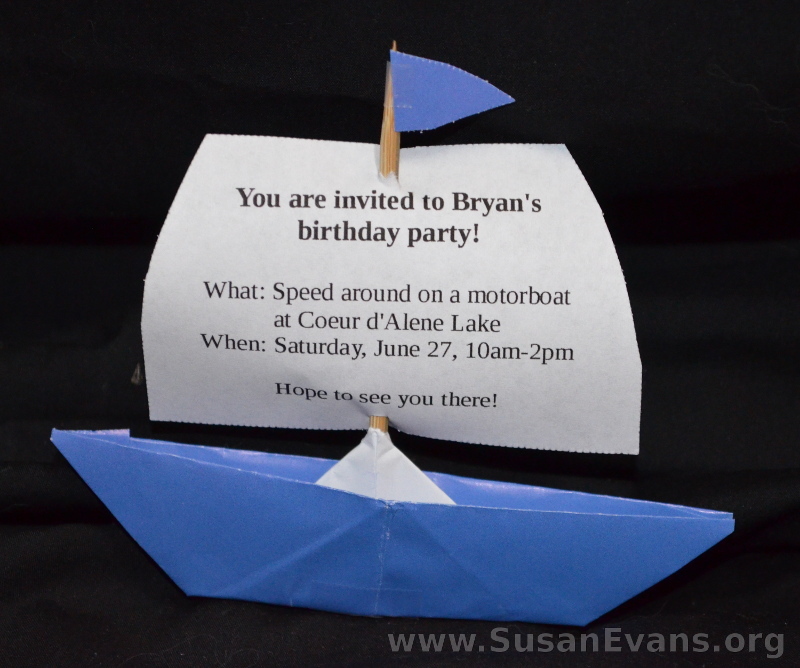 I made the boat invitations by using some origami paper and folding it into a boat. Then I stabbed a wooden skewer in through the bottom of the boat, and I taped it in place. Then I printed out the information for the party, and I cut it out in a sail shape and stabbed the skewer through the sail. Finally, I added a tiny flag at the top, taping it in place. 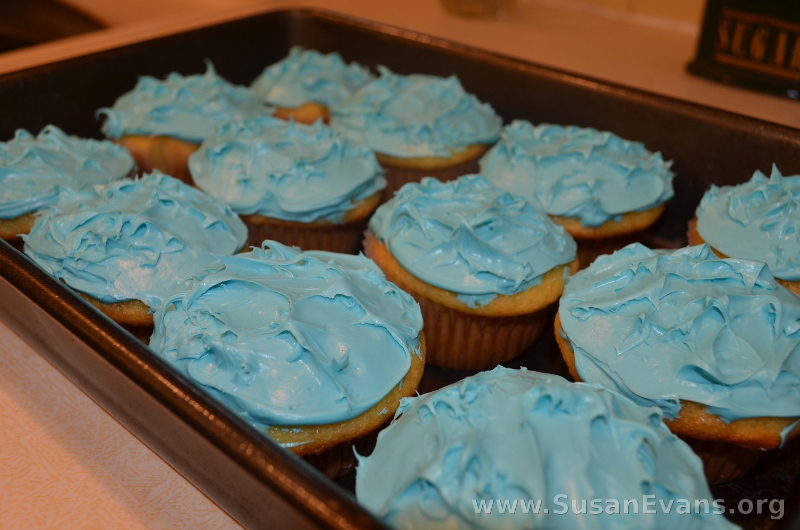 Bake some cupcakes and frost them with blue frosting. You will need to stir blue food coloring into white frosting. With a knife, make little waves on top of the blue frosting “water.” Super easy! You will want to make cupcakes rather than cake if you are planning to eat it on the boat. Make sure to place the cupcakes into a container and put them on ice in a cooler so that they do not melt on a hot summer day in the boat. Enjoy a day of boating. Often the best gifts are experiences. 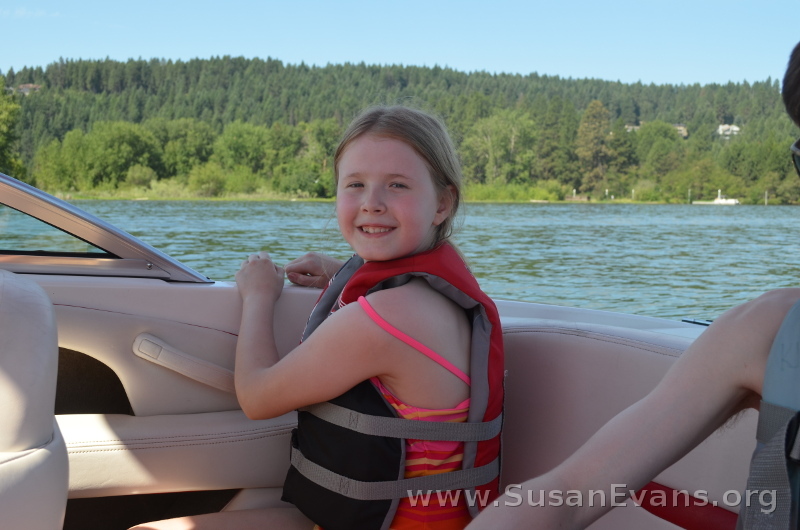 My daughter had never been on a boat, so it was super exciting for her. 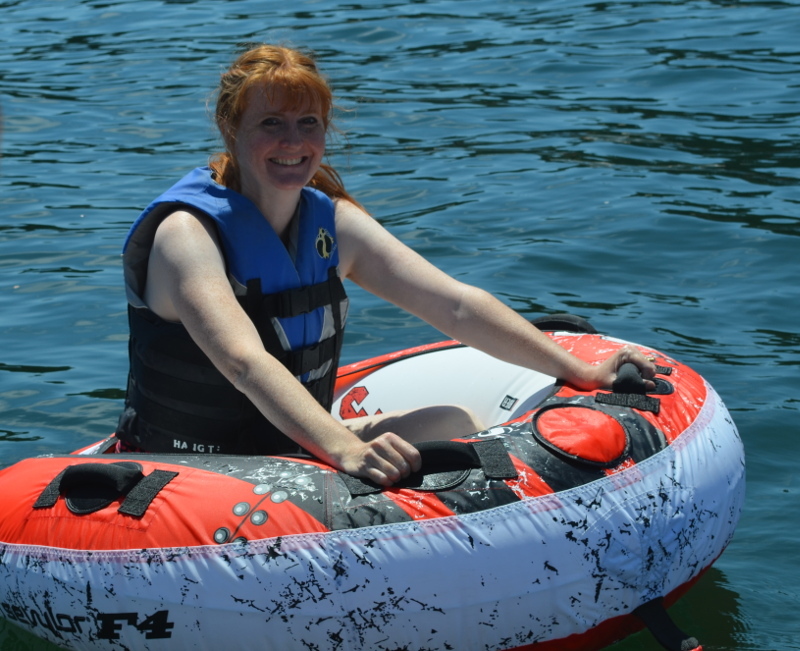 We borrowed a large innertube from a friend and attached it to the boat. 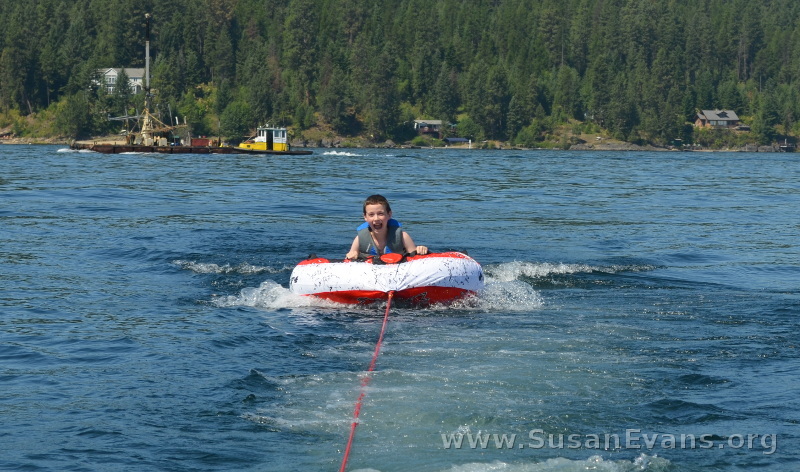 The kids loved taking turns being pulled on the innertube by the boat! Okay, maybe the children weren’t the only ones enjoying the boat birthday party! 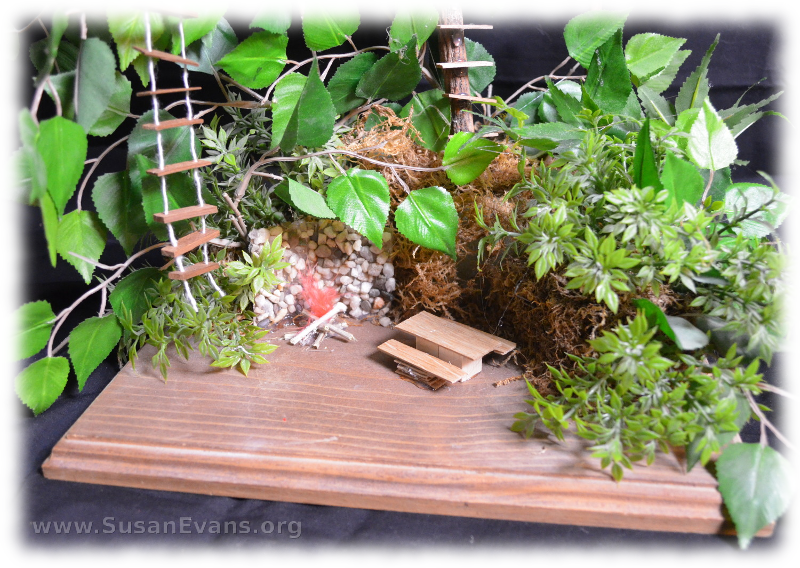 Making a miniature treehouse with your kids can be super fun, especially if you are reading Swiss Family Robinson as a read-aloud! Or it can be a fun open-ended toy for your children instead of an ordinary doll house. 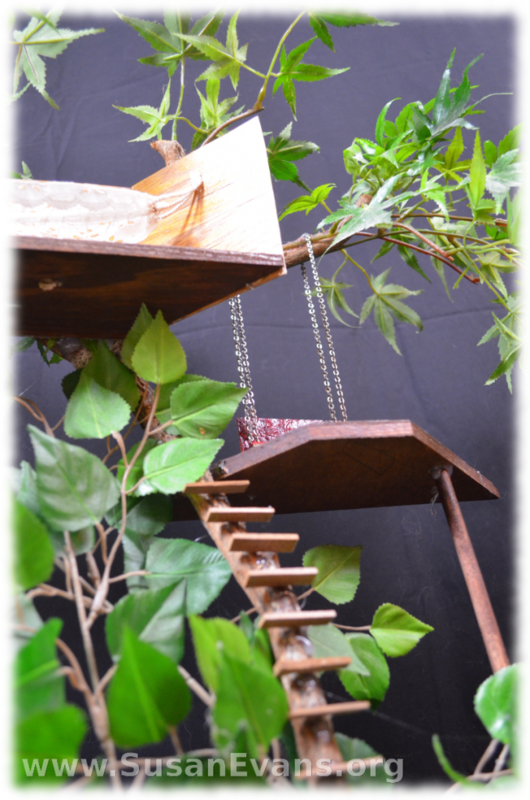 I’ve always been fascinated by treehouses, so this was a fun experience for my sister and I to make. Step 1: Start with the base. Get a wooden base at a craft supply store, or cut a base from a piece of wood. Stain the wood dark brown or paint it. Drill a hole in the back center, and insert the branch into the hole. Hot glue the branch in place, and hot glue the silk leaves into place. Step 2: Decide how many levels you want in your treehouse. Stain or paint the wood after cutting it into the shape you want. I already had wood scraps, and I used what I already had. Hot glue the levels onto the tree. If you need a pole to keep the level up, you can hot glue a pole to the top and bottom, stabilizing the level. Step 3: I made a bench swing on one level. I hot glued red fake leather to some wood and glued two pieces of wood together. We drilled four holes on the bottom of the bench swing, and I stuffed a chain necklace through the holes. 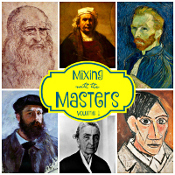 You can use a wire cutter. Attach each chain to a branch of the tree. Step 4: On the top level of the treehouse, I hot glued some walls on three sides. Then I made a hammock out of lace. 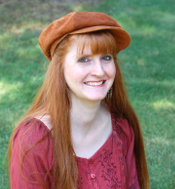 I sewed two pieces of lace together and ironed down the edges to make it look more authentic. I sewed the string to the lace and hot glued it to the walls of the tree house. Step 5: My sister made a rope ladder by drilling holes in the two sides of small pieces of wood and threading a string through them. 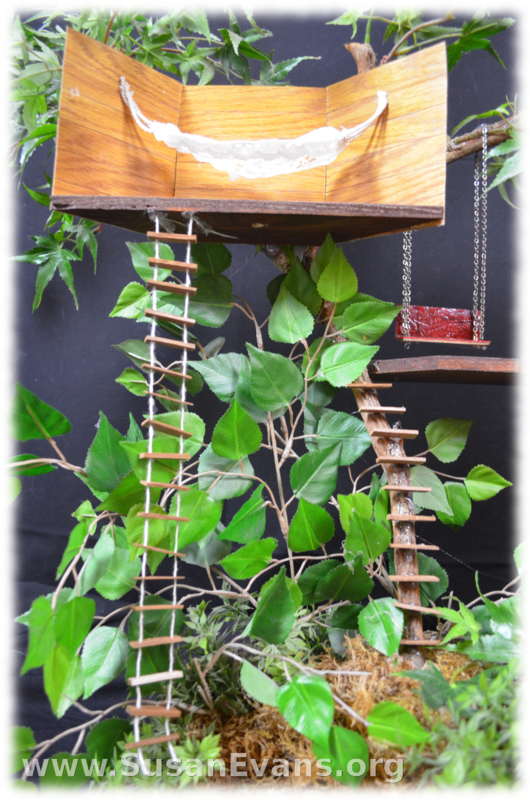 We attached the rope ladder to the upper level of the treehouse. Step 6: Hot glue small pieces of wood to the trunk of the tree, like steps leading up to the first level. Super easy! Step 7: Make a picnic table by hot gluing pieces of wood together until you have a structure resembling a picnic table. Step 8: Make a fireplace by opening a toilet paper roll with scissors. Put hot glue onto the open toilet paper roll and quickly dump lots of small pebbles on it. Lift up the toilet paper roll and see where you need to add pebbles. Hot glue any pebbles down. Step 9: Get some twigs to use for logs and assemble them to look like a bonfire. Hot glue an orange or red feather to it for the flames. 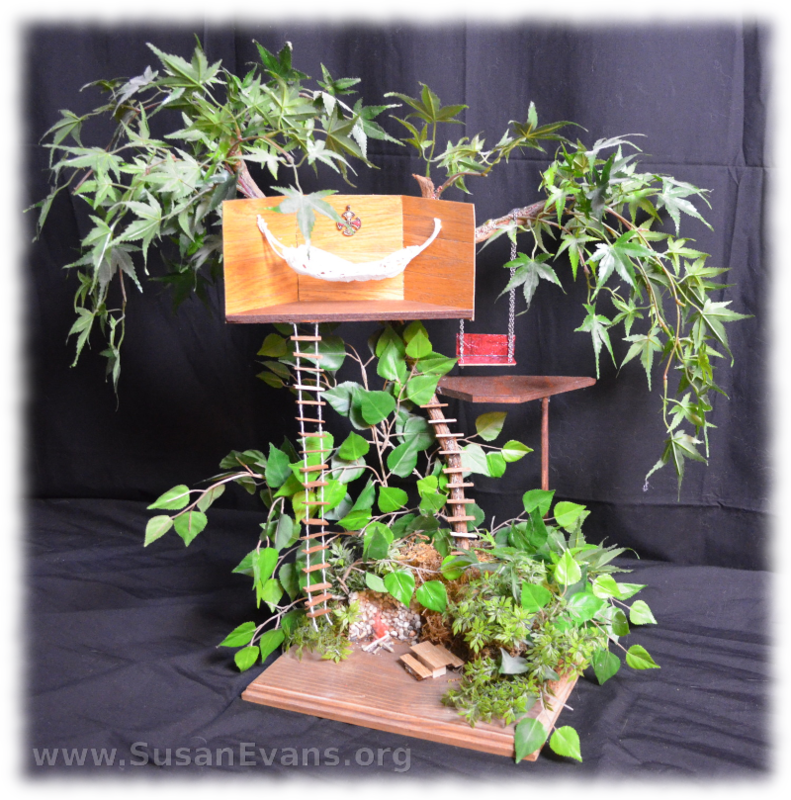 You have now completed your miniature treehouse. Isn’t it cute? 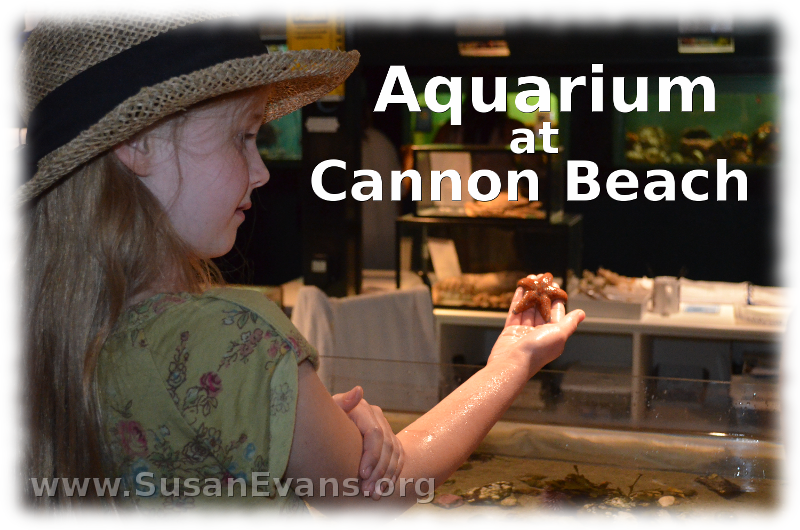 We visited an aquarium at Cannon Beach called Seaside Aquarium. You can feed otters and see several octopuses, lots of anemones and other fish, and a petting zoo. It’s a small aquarium that has been open for over 70 years. It’s not really at Cannon Beach, but at a nearby town called Seaside. If you’re taking a vacation at Cannon Beach, it’s only about 15 minutes away. 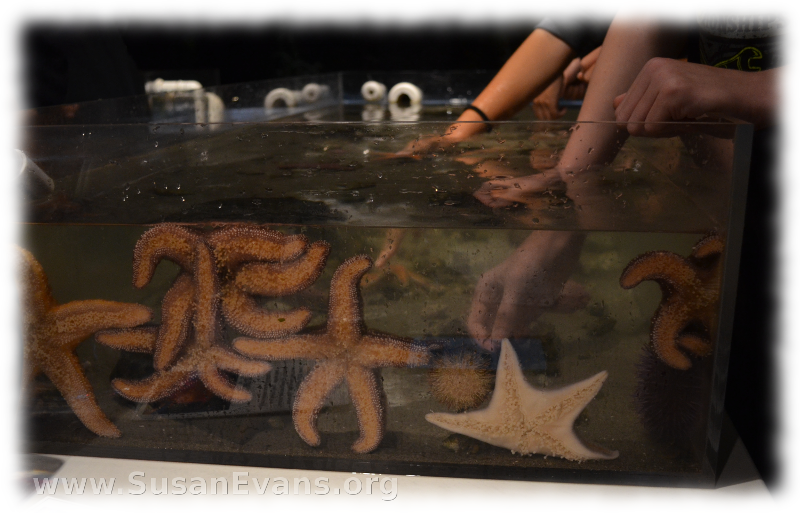 Two of my children loved feeling the sea stars and sea cucumbers with their fingers. 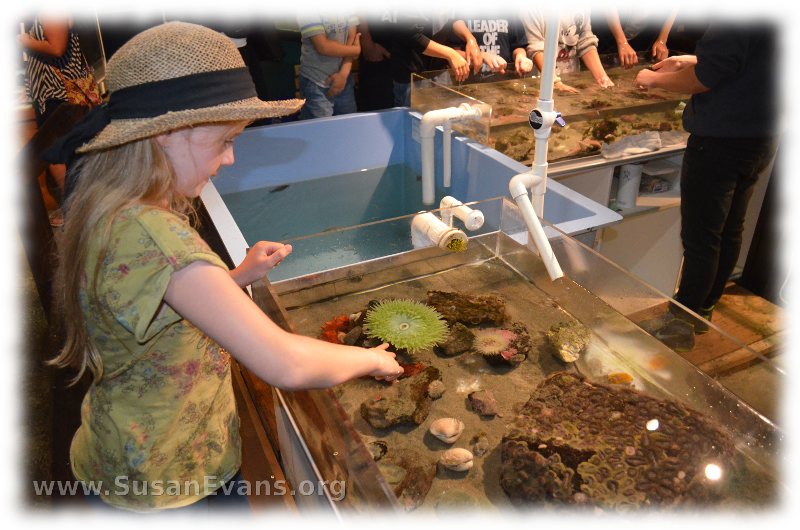 The aquarium has one large room surrounded by glass aquariums. It has another room with the otters. In the main room you also have an area with a red octopus swimming around. What I’m saying is that if you expect a large elaborate aquarium, you will be disappointed, but if you expect something small, you will be delighted. 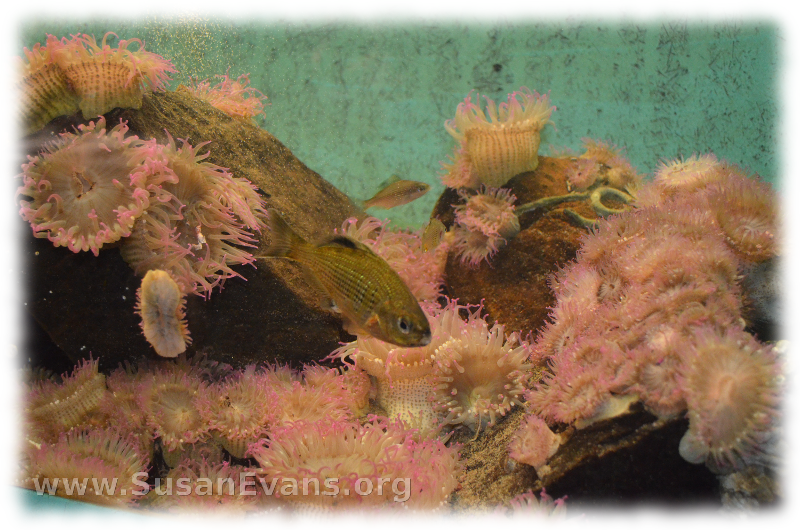 The aquarium around the edges of the room is all salt water, with colorful eels, anemones, and shellfish. Rocks are covered with living creatures. My son Stephen is my biologist, and he has always loved living creatures. He was glued like a magnet to the petting zoo area of the aquarium. He would watch how creatures responded to his touch. He also loved having a hermit crab tickle his fingers as it walked across his hand. 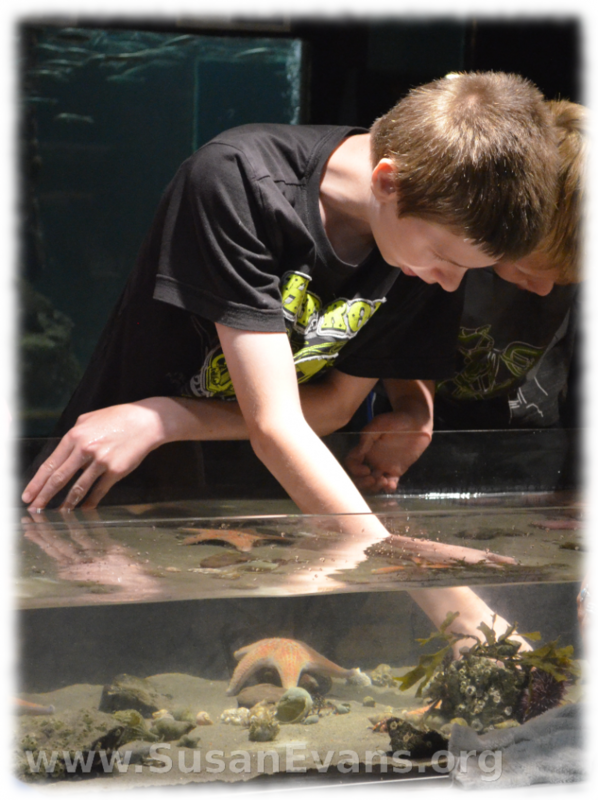 He spent nearly an hour touching the beautiful and intriguing sea creatures. 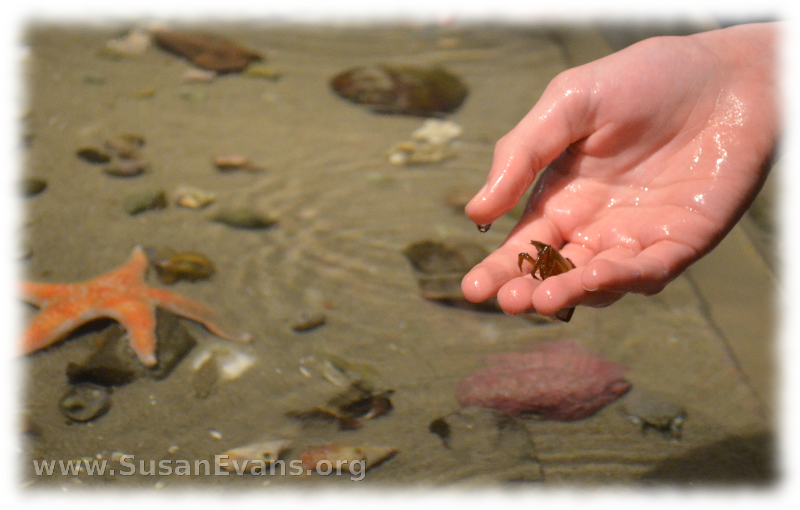 My daughter enjoyed touching the sea creatures as well. My other two sons preferred not to touch the sea creatures, but to look at them from a safe distance. They looked at the calm swaying of the tentacles of the sea anemones. They watched the fish swim around in the water. One tank had a lot of sea stars. The stars are sort of prickly to the touch, and their mouth is underneath. 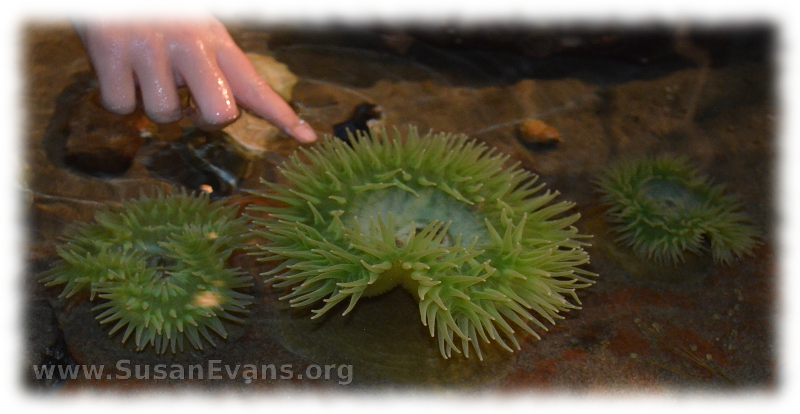 A sea urchin was also in the same aquarium, but it was so prickly that it felt like a pin cushion. 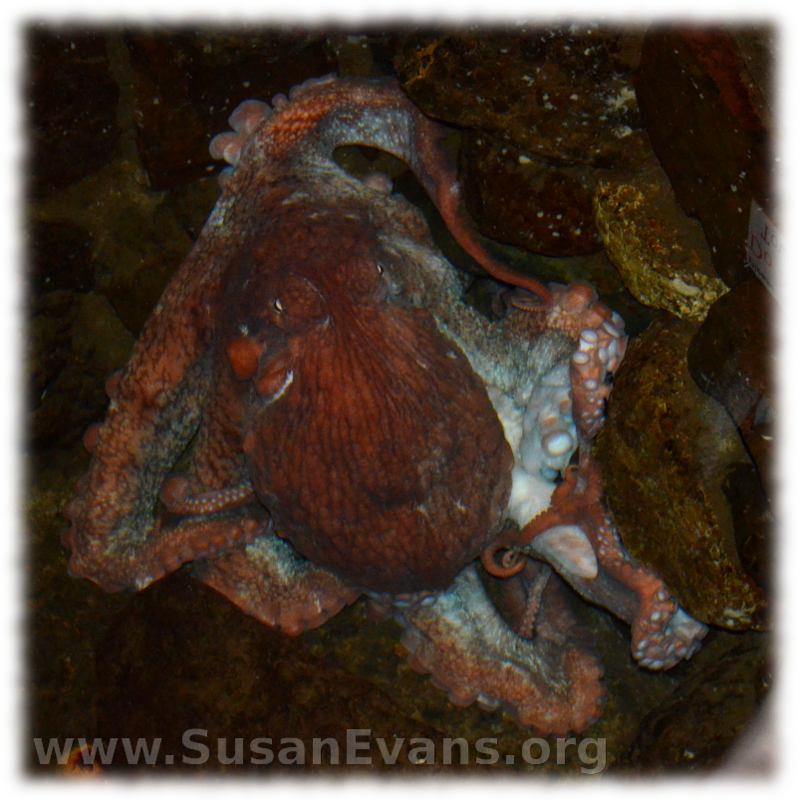 Here is the fabulous octopus, the terrible monster of the deep. It reminds me of when we studied 20,000 Leagues Under the Sea, where the octopus attacked a submarine! Here are some squid eggs. 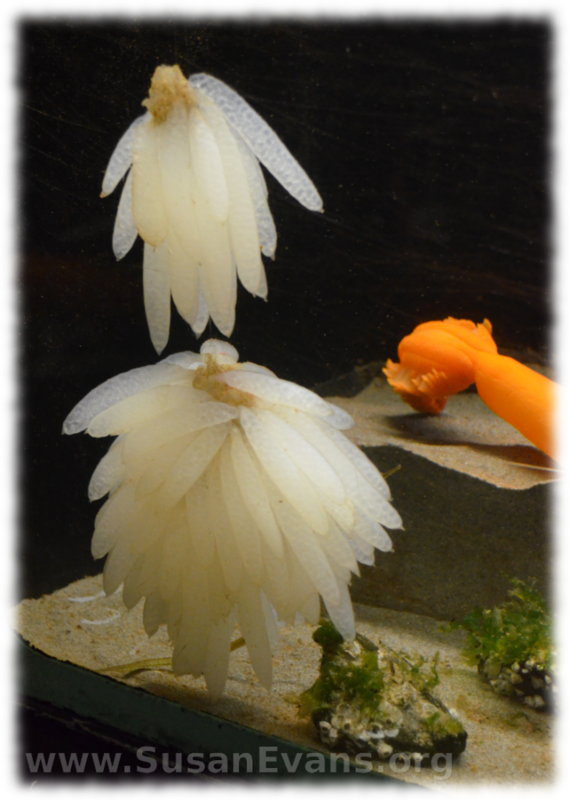 The long white sacks are filled with eggs, and the parent squid dies shortly after laying the eggs. We had a great time at the aquarium at Cannon Beach. The next day my daughter asked if we could go back because she loved it so much! The tide pools of Cannon Beach were beautiful. Here are some pictures we took on our recent vacation to Cannon Beach. 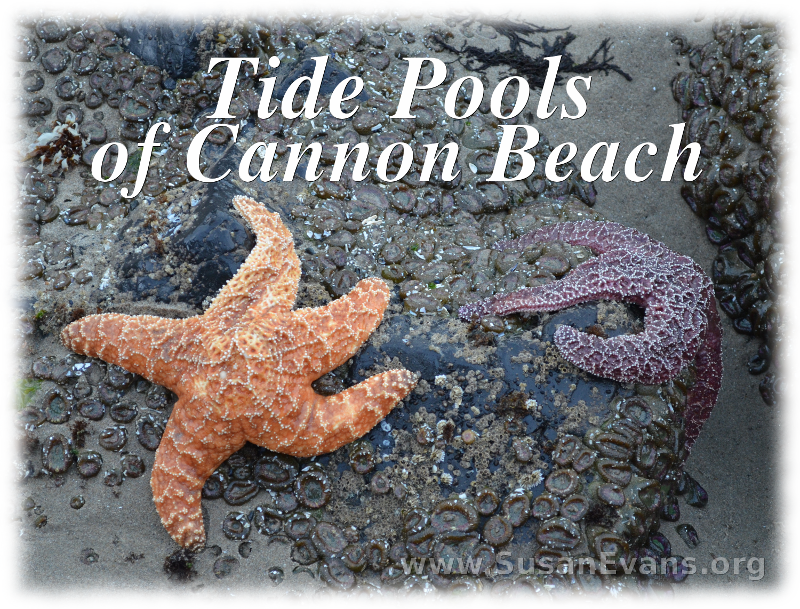 You have to look up the tides of Cannon Beach in order to find out when the low tides are, so that you can find the tide pools. There are no tide pools at high tide because the ocean is covering the area. 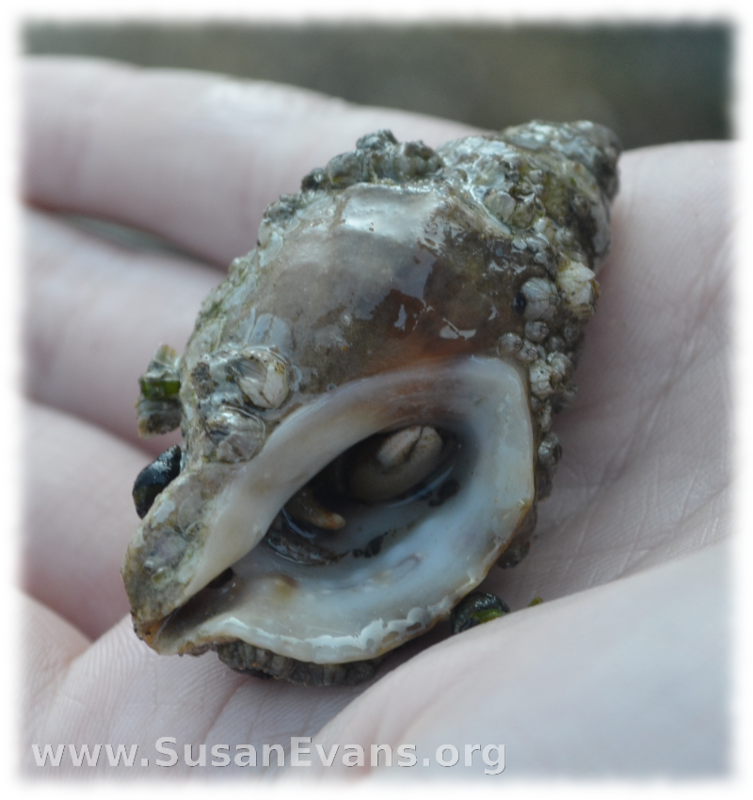 It’s only when the tides retreat and leave behind pockets of water that you will find beautiful creatures residing in their midst. 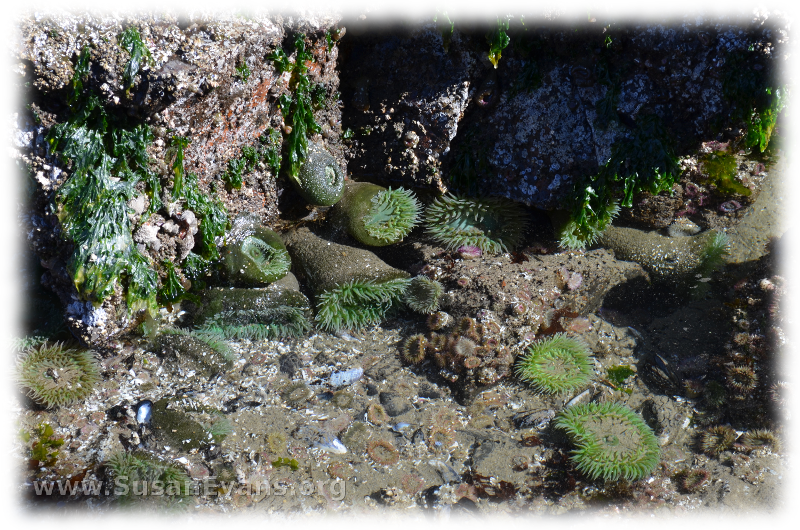 If you go to Haystack Rock (the triangular rock jutting out of the water), you will find the best tide pools there. We went at three different times of the day, and there is a big difference in what you see. 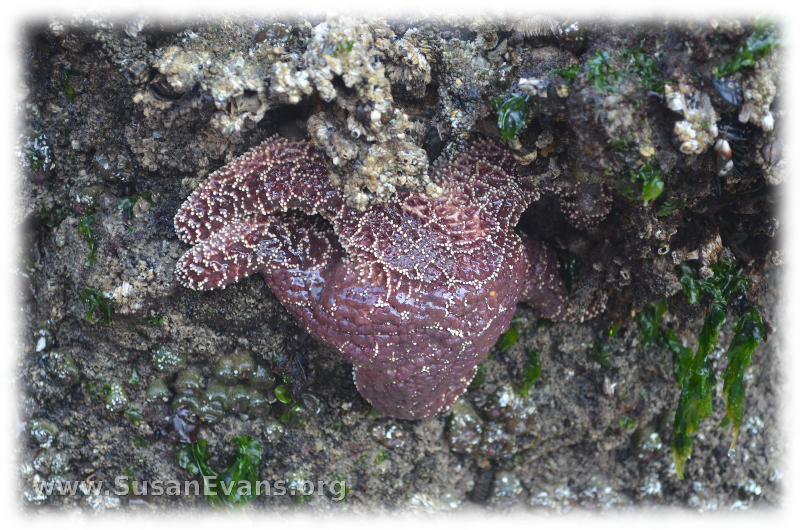 When we went in the afternoon, there were lots of people, and it was hard to find even one sea star. 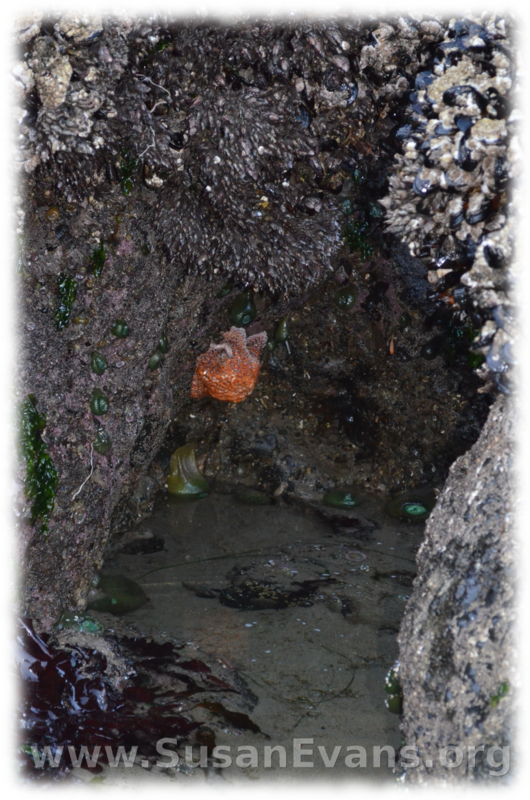 We finally found one, and after half an hour at the tide pools, we had located about five sea stars in total. 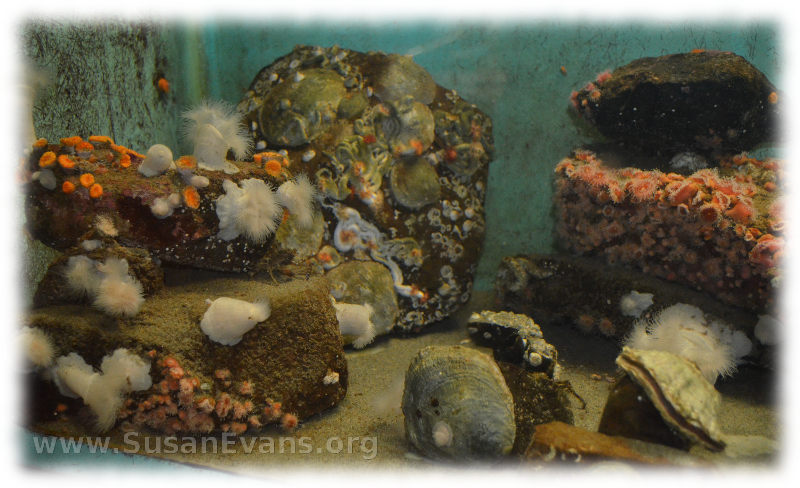 There were lots of anemones and hermit crabs. The second time we went was in the early morning around 6am, which is a much better time to go. Not very many people were there. We saw a large crab and many other creatures we hadn’t seen the previous afternoon. Best of all, we saw maybe 50 different sea stars, all hugging each other and overlapping sometimes. It was beautiful. Up on the rock you could see puffins nesting, if you looked closely with binoculars. I’ve always loved puffins, so this was a nice surprise. 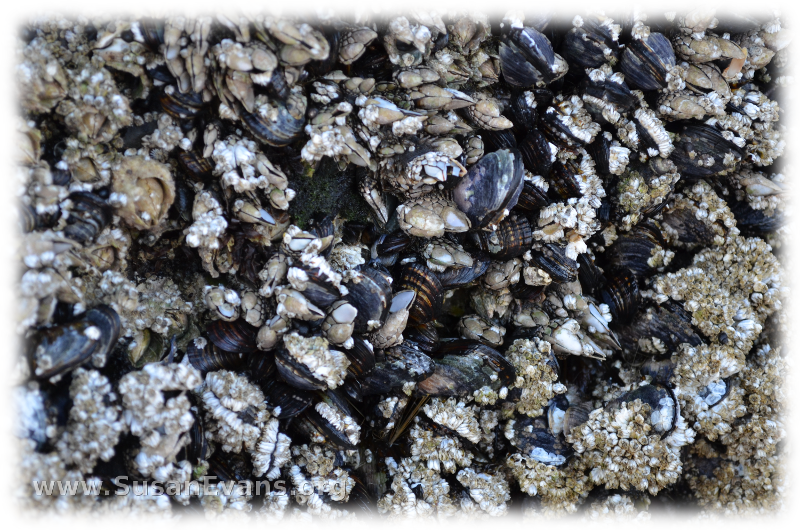 The sides of the rocks were covered with barnacles and other shellfish. The rocks were alive, as you could hear them clicking shut. My son saw a couple of mussels opened, and he touched them before they retreated into their shell and snapped shut like a Vanus Flytrap! 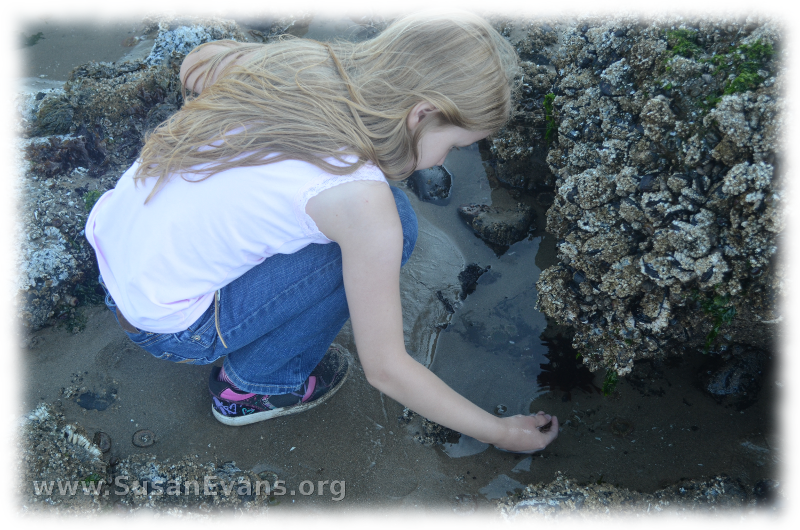 Here is my daughter picking up a hermit crab. She liked the hermit crab to walk along her hand. After playing with it for a while, she placed it back into the water. 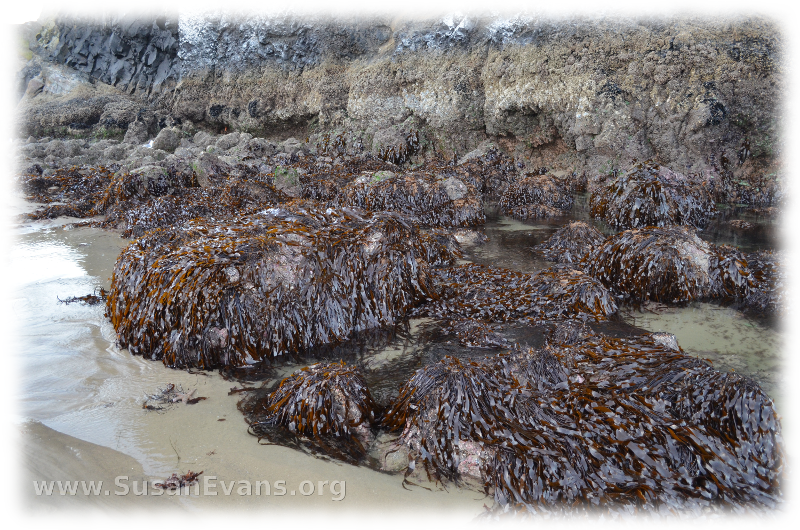 Kelp covered a lot of the rocks as well. In the early morning, you could pull back the kelp like a curtain to find crabs, fish, and other sea creatures that were hiding from the light. My husband went to the tide pools at 3am one night when he couldn’t sleep, and he said the tide pools were spectacular! He saw enormous sea stars that were two feet across. He saw crabs that scurried away when he shone his flashlight on them. The colors were beautiful as he shone his flashlight on the sea creatures in the tide pools in the middle of the night. Unfortunately my husband didn’t take a camera with him, and the tide pools themselves were an unexpected surprise. As we sat around the campfire one night, my son Stephen wanted to hear more about the tide pools in the middle of the night. 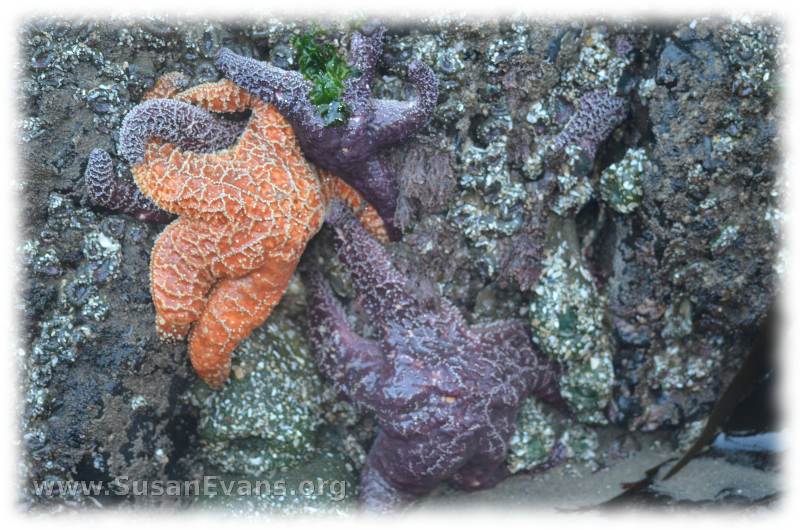 My husband’s description seemed incredible, and we wished we had another night in which to grab flashlights and explore the tide pools when they were thriving with so much life!